Nestled in the middle of the Iglesiente mountains in the southwestern part of Sardinia, the ruins of the Punic–Roman Temple of Antas offer visitors a truly majestic sight. After lying abandoned for centuries, the temple was discovered in 1838 and extensively restored in 1967. Most impressively, the original Ionic columns were excavated and re-erected. The present visible structure dates to the 3rd century AD on a floor-plan from the Augustan age. The area, rich in silver, lead and iron, was originally a Nuragic necropolis in use in the early Iron Age (9th-8th century BC) and identified probably as a sanctuary. The god worshipped here was Babai, the main male divinityof the Nuragic civilization. Attracted by its metal deposits, the Carthaginians colonised the area at the end of the 5th century BC and built a temple in honour of the Punic deity Sid Addir, god of warriors and hunters, who personified the indigenous god worshipped in the nearby Nuragic sanctuary. Its construction was divided into two phases: the more archaic dates back to 500 BC when the place of worship was made up of just a simple rectangular cella (sacred enclosure) where a rock served as a sacred altar. Later in approximately 300 BC occurred a series of transformations. The area has produced numerous fragments of Punic sculptures and a large number of dedicatory inscriptions. Some remains of the Punic temple can be seen in front of the temple, which were covered in roman times by a broad staircase. 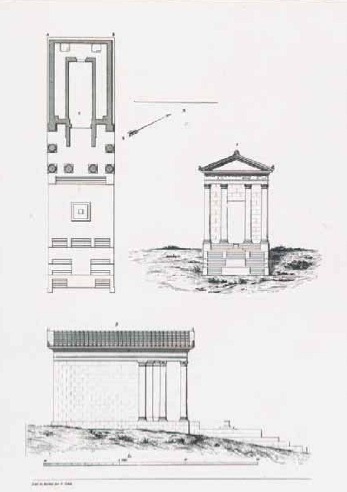 The Roman temple was built exactly on the site of its Punic predecessor and the Romans in their turn identified the Punic deity as Sardus Pater. Both Sallust and Pausanias record that Sardus was the son of Hercules who migrated out of the land of Libya to settle on the island of Sardinia which he called after himself. Under the Roman emperors the cult of Sardus was encouraged because in Rome there was a temple dedicated to Hercules on the Forum Boarium which made a strong connection between Sardus and Rome. The temple was built on a podium accessible by a wide flight of steps on the front side consisting of various levels. On the fourth stood the altar in which, according to Roman rituals, the sacrifices were made. The podium is 20 m long and is divided into three parts; the proanos, cella and adyton. The proanos has four Ionic columns (tetrastyle) upholding the main beam that contains the famous Latin inscription: Imp(eratori) [Caes(ari) M.] Aurelio Antonino. Aug(usto) P(io) F(elici) temp[(lum) d]ei [Sa]rdi Patris Bab[i/vetustate c]on[lapsum] (?) [—] A[—] restitue[ndum] cur[avit] Q (?) Co[el]lius (or Co[cce]ius) Proculus. The inscription reveals that the temple was restored under the emperor Caracalla and dedicated to the god Sardus Pater Babi, the forefather of the Sards, by a man called Proculus. This dates the restoration phase to around 215 AD, but the Roman version of the temple could have been built as early as 27 BC under Augustus. The columns of the proanos had a height of approximately 8 meters and were built of local limestone with attic bases. They were surmounted by Ionic capitals. The cella, the central hall of the temple, had large pillars leaning against the perimeter walls supported by roof beams. Its floor was covered with a black and white mosaic of which only part has survived. Only the priests could access the cella. At the back of the temple was the adyton. It was divided into two rooms, each with their own entrance and in front of their doorway two square water basins on the floor which contained holy water for purification ceremonies (ablution). This feature was uncommon for Roman temples and is further evidence of Romans borrowing Punic religious beliefs. One of the rooms housed the bronze statue of the Punic god Sardus Pater of which only a finger of one hand was found. At approximately 1 km from the temple are located the Roman quarries from which limestone boulders were extracted and used for the construction of the sanctuary. The work was carried out with hammer and chisel, while the transport was probably made by carts pulled by oxen. The line cuts which were followed to extract the limestone blocks are still visible. The temple’s isolated position in a fertile valley makes it an enchanted place to visit and offers visitors a great natural scenery. It is one of the most impressive and interesting archaeological remains on the island. For further info visit the official website & Tharros.info. Original article on Following Hadrian.